Roger Iker's paintings capture the spirit of the old west in images of Longhorns and Cattle Drives. 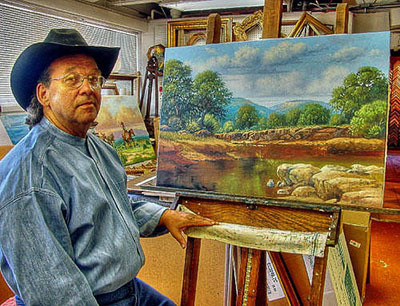 His landscapes speak of the unique, unspoiled beauty that is Texas. You will not find any hidden objects inside Roger's paintings, and you will not find images of women bathing in a water trough. Nor will you find the same contrived, tired paintings that have been done a hundred times. No gimmicks...just good Texas art that has held and increased it's value over the years.